MR. NOFACE'S SHRUG LIFE: Torture By Any Other Name, Would Be Just As Wrong! Torture By Any Other Name, Would Be Just As Wrong! A technique that consists of immobilizing the victim on his/her back with the head inclined downwards, and then pouring water over the face and into the breathing passages. By forced suffocation and inhalation of water, the subject experiences drowning and is caused to believe they are about to die. 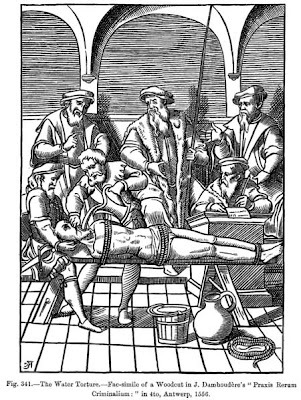 As early as the Spanish Inquisition it was used for interrogation purposes, to punish and intimidate, and to force confessions. In contrast to submerging the head face-forward in water, water boarding precipitates a gag reflex almost immediately. The technique does not inevitably cause lasting physical damage. It can cause extreme pain, dry drowning, damage to lungs, brain damage from oxygen deprivation, other physical injuries including broken bones due to struggling against restraints, lasting psychological damage or, ultimately, death. Adverse physical consequences can start manifesting months after the event; psychological effects can last for years. Let’s be clear, water boarding is torture. It has always been torture and it will always be torture. It doesn’t matter who is doing it or why it’s being done. There is no debate (or at least there shouldn’t be) on this issue. It is a fact and facts are not subjective. Like humans need air to breathe, a technique where a person is not getting that air to breathe (i.e. drowning) causing that person pain and /or agony is by definition, torture. So stop asking if water boarding torture. We should be asking if America does (or has done) torture. Well, America does (or has done) water boarding. So…There goes that moral high ground on which we were so precariously perched. The scared people who agree with these techniques are the same who feel it is right to deny civil rights to people, cultures or locales in an effort to "Keep us safe". Their "morality" is based on their own self interests and nothing more.